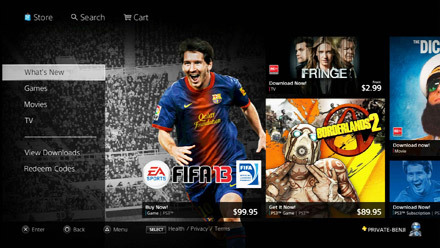 Sony has unveiled a new look PSN store, but to many this "New look" is to much like the Xbox home page. The new layout was the reason for the recent PSN maintenance which left users locked out of the store and in some cases online gaming altogether. A new search engine has been added to the store making it easier to find and purchase games, DLC or some of the other features offered on the PlayStation Store. HD screen shots have been added also so customers can see the awesomeness of the games they are considering purchasing. Personally i quite like the new look, but i am a sucker for new shiny layouts. Hopefully the next move is to revamp the home screen on the PS3.